I am forwarding this letter from Rich Budd of Minisink Valley Middle School. Rich is seeking participation for the Chris Corwin Scholarship Car Show. Please read his letter below and share this with your club membership. My name is Rich Budd and I am a Technology Teacher at Minisink Valley Middle School. 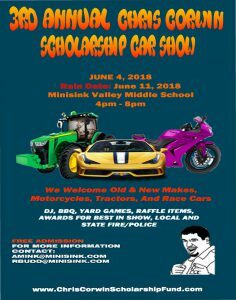 I am contacting you regarding an upcoming car show at Minisink Valley to benefit the Chris Corwin Scholarship Fund. We are hoping you could broadcast this info in hopes of trying to make the Third Annual Chris Corwin Scholarship Car Show a great event! Chris Corwin was an outstanding Minisink Valley Middle School Technology teacher whose life ended tragically in a car accident in 2016. A scholarship has been set up in his name, among other events we are hosting a car show to help raise funds for this scholarship. Last year, for the Second Annual Chris Corwin Scholarship Car Show, the community came out in full force! We had over 225 vehicles and more than 1,000 people attend. All of this helped to raise over $10,000 for the Scholarship Fund! We are looking to make the Car Show even larger this year. 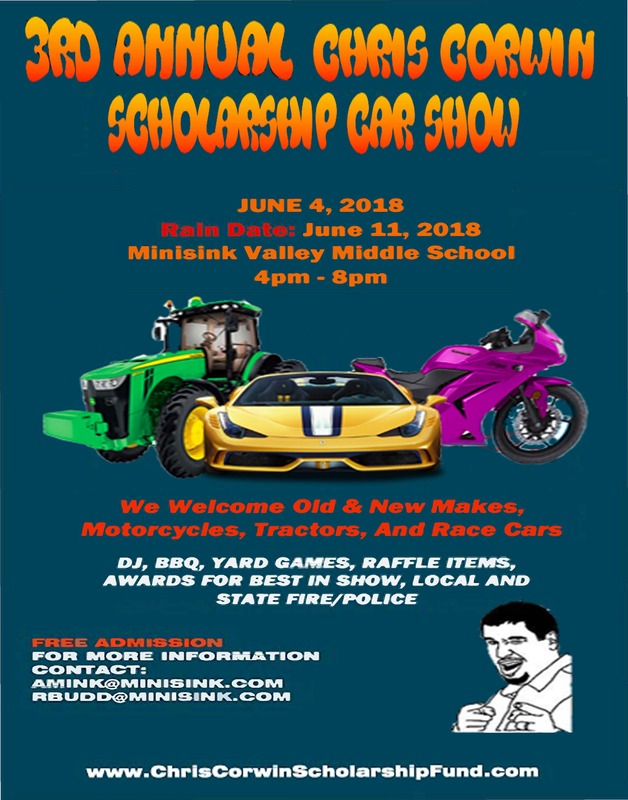 The event will be held at the Minisink Valley Middle School campus where there is plenty of parking for registrants and spectators. The event is being held on Monday, June 4th from 4pm-8pm with raffles and announcements beginning at 7pm. The rain date is set for Monday, June 11th. There will be best of show awards as voted on by the owners of registered vehicles and spectators. There is no fee for vehicle registration or spectators, however, we will be taking donations “at the door.” We will have a DJ (Strictly Entertainment), concessions, raffle items, 50/50, and activities for kids of all ages. Please note, if you would like to park with your specific car club at our show we recommend trying to arrive together. Otherwise, we will have you park near the back of our show so that you can meet up with your additional members upon arrival.